Can I serve you a slice of pumpkin smoked bacon quiche? 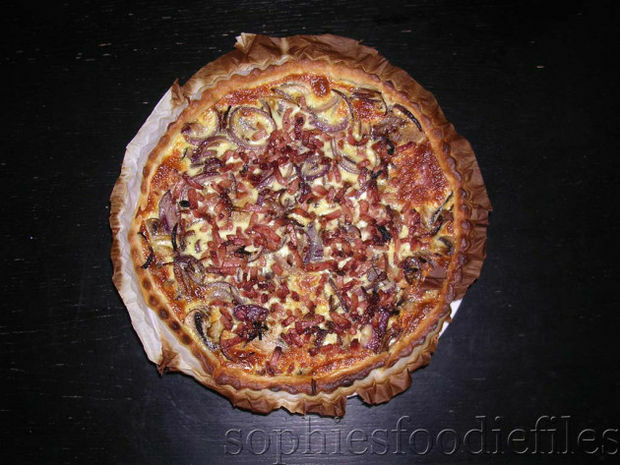 Today, I invented this lovely pumpkin mushroom smoked bacon Quiche! Ooh yes! Can I serve you a big slice? I served it with a lovely mixed side salad & a simple home-made balsamic vinegar dressing! A lovely dinner! 🙂 MMM! 1 teaspoon of fresh finely chopped rosemary, no stalks! Preheat your oven to 200°C ( 400 F) for about 10 minutes. In a large non-stick roasting pan, place pumpkin chunks in 1 layer in it. Scatter 1 tablespoon chopped rosemary over it all. Season with 10 grins of black pepper & 10 grins of pink salt. Finally, drizzle your fruity oil over & mingle with clean hands. Place into the hot oven & roast until tender. This took me 25 minutes. Take out of the oven & close oven door, to keep oven hot. At the same time, take a large non-stick pan & heat up on high. When hot, add a few drizzles of that same oil & heat up. Add chopped garlic & onion. Fry for about 5 minutes & add chopped mushrooms & rosemary. Stir often & lower your heat if you need to. Now, add smoked bacon pieces & fry until cooked through & browned on all sides, stirring often. When ready, place fitted lid on. 15 minutes before you are going to use your pastry, take it out of the fridge & out of the package. Leave it to rest rolled out. Preheat your oven again for 5 minutes or so. Take your iron cast tin & oil it. Place baking paper in it, neatly. Now, with 2 hands, put your pastry on top of your baking paper & place it neatly into the bottom & sides of the tin. Do this with help of your hands & fingers. See that there are not any holes, otherwise close them with the pastry. Prick the base several times with a fork. Put mushroom-bacon mix on the bottom, evenly spread out. This will be the 1st layer. Now, put roasted cooled pumpkin pieces on top of it all,…this is your 2nd layer. In a bowl, crack 2 eggs. Beat loose with a fork. Pour soy cream in it. Whisk it all together. Add some seasoning. Mix with fork. Pour this cream-egg mix all over the pumpkin-veggie-bacon layers, all evenly divided. This will be your 3rd layer. Placing pastry on top of baking paper, in bottom & sides! The 1st layer is in! The 2nd layer is in! The 3rd & 4th layer is in! Do you want a slice of Vegan spiced tofu quiche? 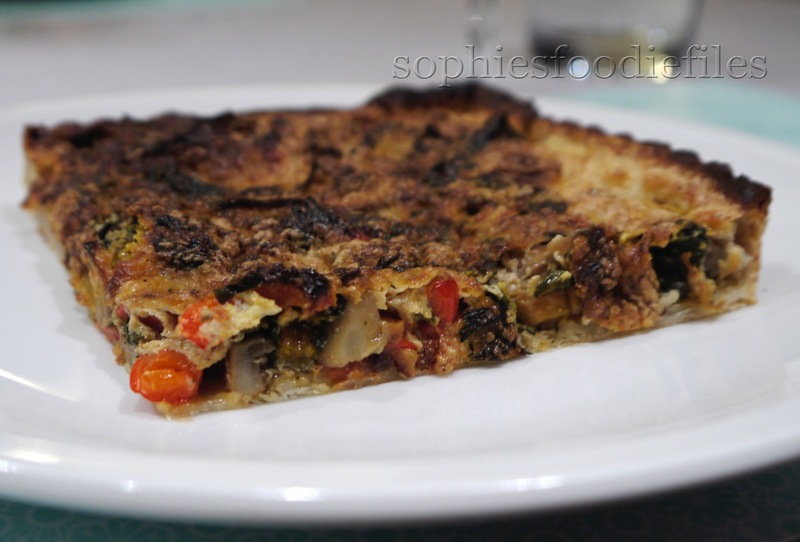 Yesterday evening, I invented this fabulous Vegan Spiced Tofu Quiche! I had a leftover organic vegan puff pastry that I needed to use up. Check it all out! I had a new square non-stick pastry tin that I needed to try! It really worked out well! I just had to grease the tin, sides & removable bottom & the Quiche came out perfectly! 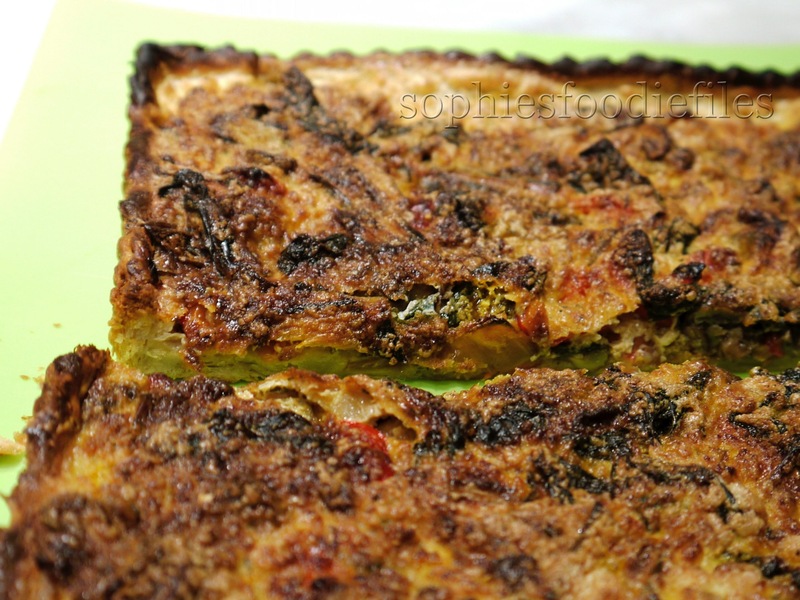 It was the 1st time, I created a vegan Quiche using drained & Vitamixed silken tofu! My husband & I ate 2 pieces each. In the pst, I made Vegan Quiche tartlets using a home-made spelt oil pastry & using soy cream in my tartlets! You can find the recipe: Here! You can serve it with a nice simple side salad & dressing but I didn’t bother! 🙂 Yummmmmm! 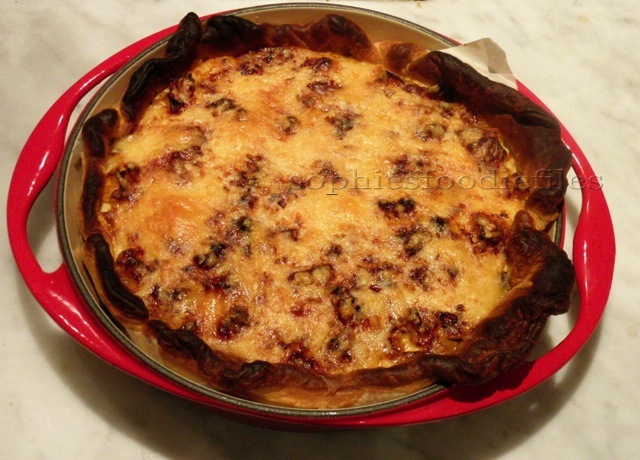 Recipe : For 1 medium Quiche: 22.5 cm x 22.5 cm! 3 filled cups + 1/4 cup orange chard, ( well pushed into the cups), (168 gr),well rinsed, pad dry, leaves & stems used, cut up into smaller pieces & leaves cut up into smaller pieces = 1 bunch! 1 dried red chili pepper, stem cut off, cut up finely & use the seeds too! 1. Take an oven rack out of your oven & place a Silpat over it. Take your non-stick pastry tin & smear it all in with vegan butter. This means, the bottom, the sides all the way up & the removable bottom too. Place it on the Silpat. Preheat your oven for 10 minutes on 210°C ( 410 F). 2. Place a larger pan & heat up on medium high. Add some drizzles of that fruity evoo in it & swirl it around. When hot, add chopped garlic & chili pepper. Fry for a few minutes, stirring often, lower your heat if you need to. Now, add red pepper strips & cut up stems of your chard. Add some salt & 10 grins of black pepper. Stir often & fry until nearly al dente. This is about 8 minutes. Finally, add chopped chard leaves. Stir often & add a splash of hot water to the pan & place fitted loud on. Let the chard steam until al dente. Check seasoning again & place fitted lid on. At the same time, heat non-stick pan oh high heat. Add drizzles of olive oil & few knobs of vegan butter & heat up. When hot, add chopped mushrooms & 1/2 teaspoon of dried Provençal hens. Stir often & fry until cooked through & browned on all sides. This will take a few minutes. Add fried mushrooms to veggie mix & stir through. 3. Your drained silken tofu, check it agin. Pour the excess of water off & place the tofu in your Vitamix. Blend it together on high-speed until a bit thicker & really creamy. Place your veggie mix into a larger bowl & pour the Vitamixed tofu onto the veggie mix. Mix carefully with a spoon. Check the seasoning again. Placing the excess of pastry where you need it! 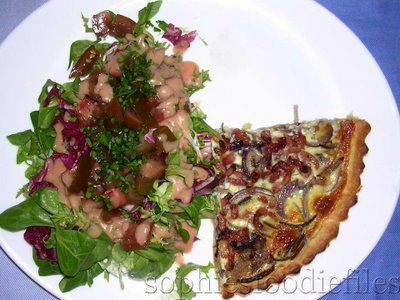 My husband’s bacon, mushroom & red onion quiche with a side salad! One evening, I was too tired to make dinner! My husband had the afternoon off & offered to make us dinner! It was this lovely combined dinner! So delicious too! 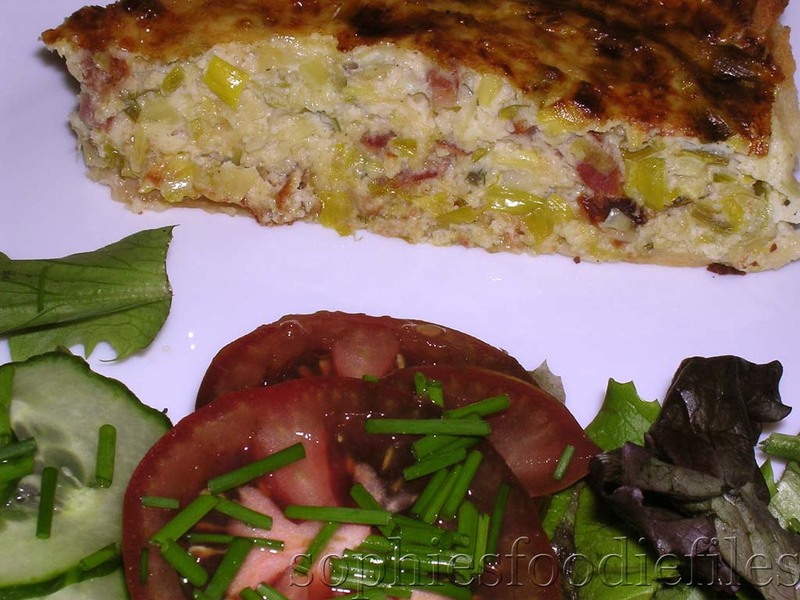 A Speedy tasty quiche with a seasonal side salad! 🙂 Yum! Chili oil is made by using whole fresh chili’s, dried or not, cut open, green er red ones, about 10 of them, by putting them together in a small bottle. Then you pour a neutral olive oil over them. Put a lid or a pouring tip on it & place into a dark place for about a few weeks. Stir from time to time, the chilli’s around. You can use the oil after a few weeks of waiting. Lovely stuff & it is so easy to make! 1. Take your roll of puff pastry out of the fridge, 20 minutes before use. 2. 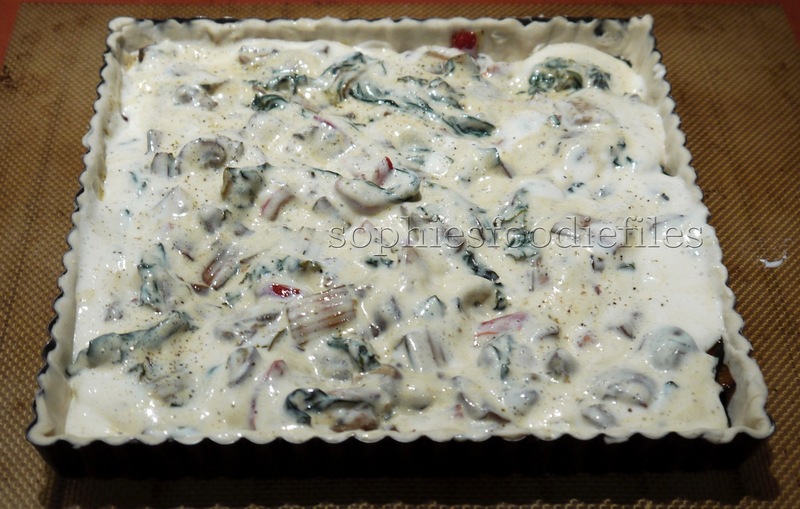 Preheat the oven to 200°C , ( 392 F ) 10 minutes before placing the quiche into the oven. Take a large non stick pan & pour liquid margarine in it. Heat up on high. When hot & sizzling, add the slices of mushrooms to the pan. Fry until lightly golden, but not completely cooked trough otherwise the mushrooms will get dry when cooked into the oven. Grind some black pepper over them according to your taste. Take the mushrooms out of the pan. 3. Heat up on high again. Add baking margarine. Add the 3 medium sliced onion wedges & fry until golden & cooked trough. Take out the onion parts & set aside. Heat up on high. Add the baking margarine & when hot, add the bacon pieces. Fry until golden. Turn the heat off. Drain on 2 kitchen papers. Set aside. 4. Take your tart tin & line with parchment paper. Place your prerolled pastry in the tin & let the pastry hang over the sides. Now, with your fingers, with your tumbs, line the pastry neatly into the tin. Cut the excess pastry off. Roll with a rolling pin over the tarte tin. The excess of pastry will fall off. 5. Prick with a fork several times into the dough. You haven’t got to prebake the dough. 6. Spread the onion wedges all over the pastry, evenly divided. Add the mushroom slices, also evenly divided. Now, add the bacon pieces. Pour the mixed eggs with the cream all over the tin. Grind some black pepper & some Maldon sea salt over the top. 7. Now, place carefully into the center of the oven & bake for 15 minutes on 200° C until golden & baked trough. 8. Take out of the oven. Place a large cup under the removable base. The outer tin side will fall off. Now, place the tart onto a plate & remove the base with a palette knife. Place onto a serving plate & cut into 4. Then remove the parchment paper. Don’t forget this! 9. Serve on a large plate with the mixed side salad, the chili Kumato tomatoes & the home made Cocktail sauce. Enjoy!! This is lovely enjoyed with a glass of Spanish wine like Rias Baixas, Miudiño, Albariño 2011! Stay tuned, Subscribe through the photo link below to get my new cool newsletters aka posts! Join 1,800 email Subscribers! It is free! Click onto this link below! 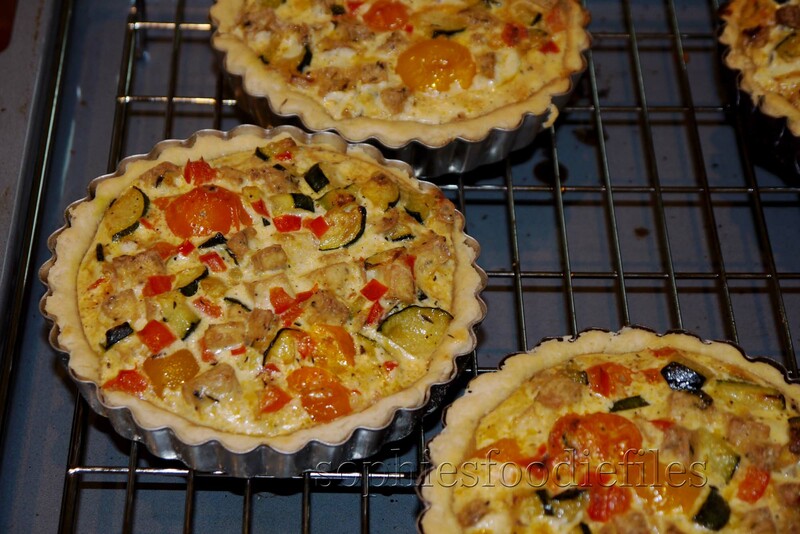 Vegan zucchini (courgettes ) & veggies quiche tartlets! 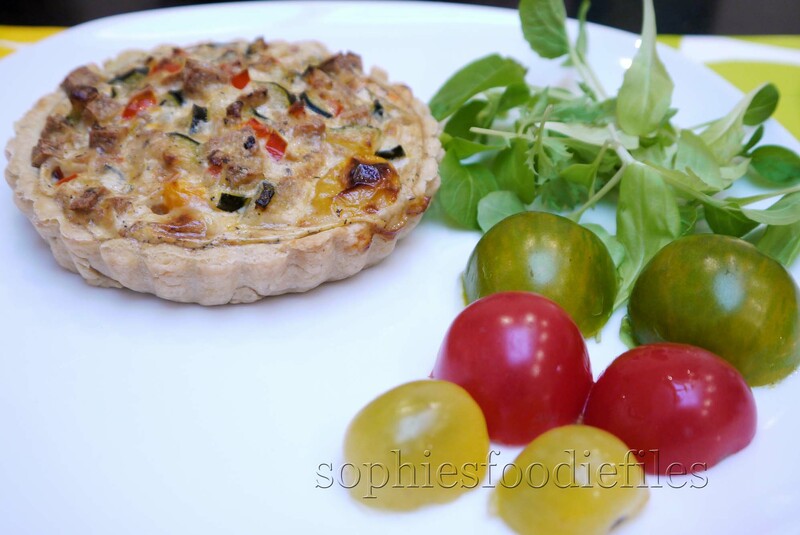 A divine & tasty vegan zucchini & veggies Quiche tartlet with a side salad! MMM,..What’s not to love here? 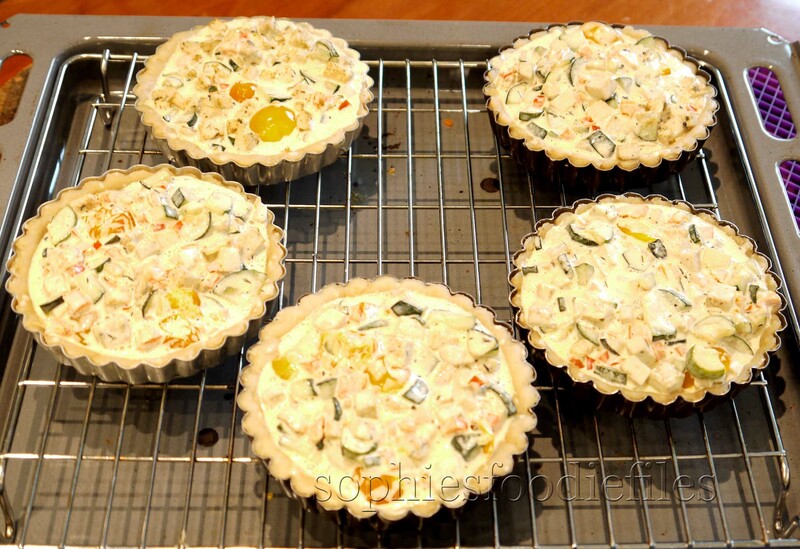 Yesterday, I invented these stunning, appetizing & wonderful vegan tartlets with a lovely vegan filling of courgettes ( zucchini) from my own garden, mixed cherry tomatoes ( yellow & orange ones), garlic a red bell pepper pieces. In added fried tofu with herbs chunks, for added flavour. To bind everything, I used Alpro soy cream. This is a vegan cream with no cholesterol in it! The quiches are also dairy-free, egg-free & vegan! It is so good for you & fab at the same time!! Do you agree? It was a huge success with my husband & me! Check these out & I am sure you will love it as much as we did! 🙂 I used the same vegan dough recipe as in this tasty recipe on my blog before: Vegan saffron & fennel tartlets with a warm mushroom, spinach & chickpeas salad. Just click onto the title & you will find the recipe. I just didn’t use black pepper in that vegan dough! 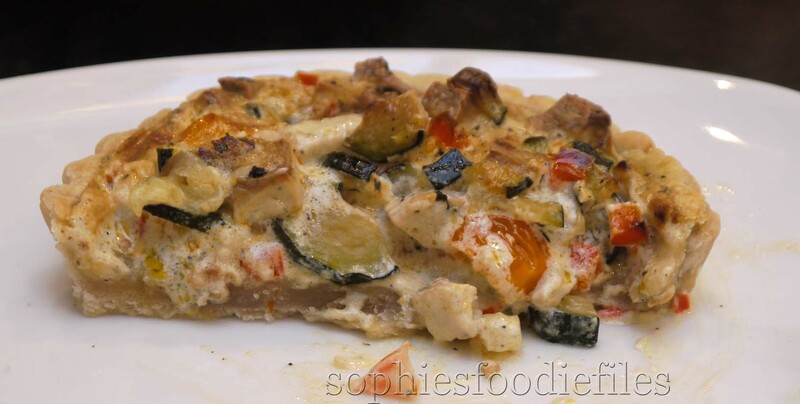 Appetizing vegan zucchini & veggies Quiche tartlets! 2 medium young green courgettes ( I used the first 2 from my own garden!! ), washed, pad dry on kitchen paper, cut into smaller pieces, see picture below! 1/2 red bell pepper, seeds & white parts removed, cut into little fine square pieces, see picture below! 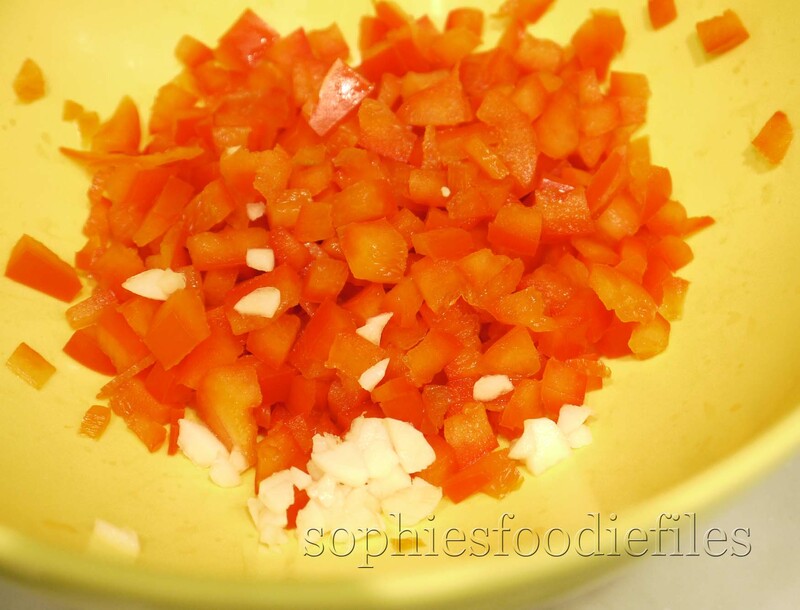 finely cut up red bell pepper & garlic! 1. A few hours before dinner, make the vegan dough. Place all the ingredients for the dough in a bowl of your Kenwood with the dough hook. Mix everything together for a few minutes. My dough was a bit crumbly, so I added 2 tablespoons of cold water extra. I also added 1 tablespoon of olive oil extra. Flour your counter with flour & flour your hands too, to prevent sticking. Place your dough on the counter. Knead your dough well, for a few minutes until it all comes together & is elastic!!! Divide it into 4 equal balls.I did add 1 tablespoon of olive oil extra. Knead it good! 2. I use 5 tartlets with removable bottoms. That’s the best & easiest way to make these beauties! Smear them all in with vegan baking margarine to prevent sticking. Flour your rolling-pin. Roll out your dough a bit thicker, about 5 to 8 mm & re-roll it if you have to. See that you have enough dough to fill one tartlet. Add a bit of the dough if necessary. Lay 1 rolled out dough & lay it over 1 tartlet. Let the dough hang over the sides a bit. Now, carefully push with your hand the dough nicely & neatly into the tartlet. Push the dough carefully up high, into the sides of the tartlet case. Now, with your thumb, push the dough round into the tartlet to fit neatly, all the sides up too. Roll with your rolling-pin over the tartlet to remove excess dough. Do this a few times. Do the same with the rest 3 balls of dough. 3. Place the 4 lined tartlets on a plate, place cling film over each one, to prevent drying out, into the fridge to stiffen up a few hours & take them out when you have prepared the filling. 4. Half an hour before dinner, prepare your veggies. Take a large non-stick pan on medium high heat & add some fruity EVOO. When hot, add the cut up garlic, red bell pepper pieces. Fry for 2 minutes & add the cup up tomatoes. Add 1/8 teaspoon of dried thyme, some sea salt & a few grinds of black pepper to taste. Stir often. You don’t want to overpower the flavour of each veggies though!! Taste! Place this mix in a bowl with fitting lid to keep warm. In the same pan, add a few tablespoons of that fruity EVOO & heat up. 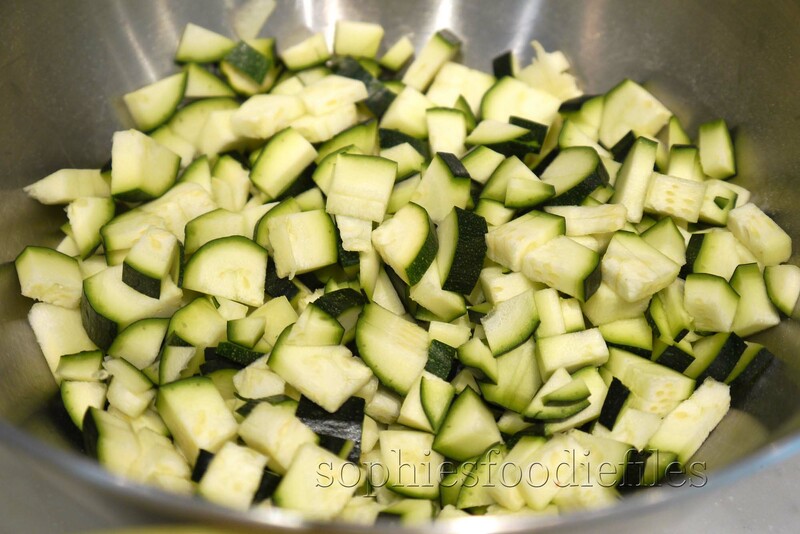 Now, add the cut up courgettes ( zucchini ) & fry until browned & edible. Season with some black pepper & some sea salt, but not too much! Add this to the veggie mix. Now, fry the tofu with herbs pieces in some olive oil until browned on all sides. Add this to the veggies mix. Pour the soy cream to this veggie mix & spoon everything round, carefully, not to break the cut up tomatoes!!! Check the seasoning agin. Add some pepper & some sea salt. Taste! It has to taste fab! See that you divide all the ingredients into each tartlet! 🙂 I just had 1 tablespoon of filling left!! Just filled & ready to go into the oven! & place them into the oven & bake for about 25 minutes. Check after 20 minutes with a pin if they are ready. My tartlets weren’t ready but after 25 minutes they were. The dough has been cooked to perfection & the filling was ready too. Prevent burning on one side! Lower the temperature with 5 ° C if you need to. When the tartlets are ready, turn the oven off & take them out of the oven. Place each tartlet on a can & let the outside of the tartlet fall off. Help with your hands if it sticks a bit. Carefully remove the loose bottom & place on a serving plate. Do the same with the 2nd tartlet & place on another serving plate. Serve with a side salad. I used young mixed salad leaves from my garden & cut up colourful heirloom tomatoes. You can add a vegan mayo if you want. Quiche Lorraine à la Sophie! 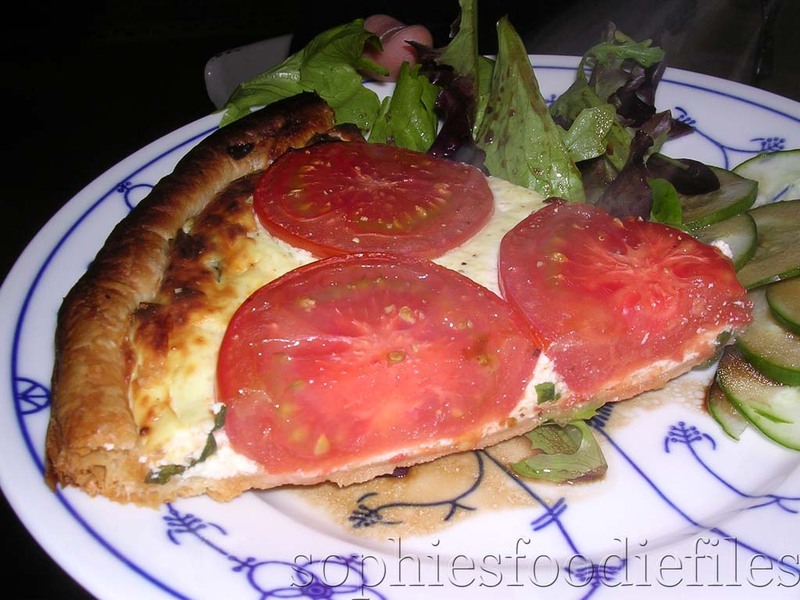 I just love-making this Quiche Lorraine! It is easy because I don’t make the crust. I use bought short crust pastry. I by pastry made with margarine so that the pastry isn’t too heavy. Also, I use 4 omega 3 eggs & alpro soy cream. 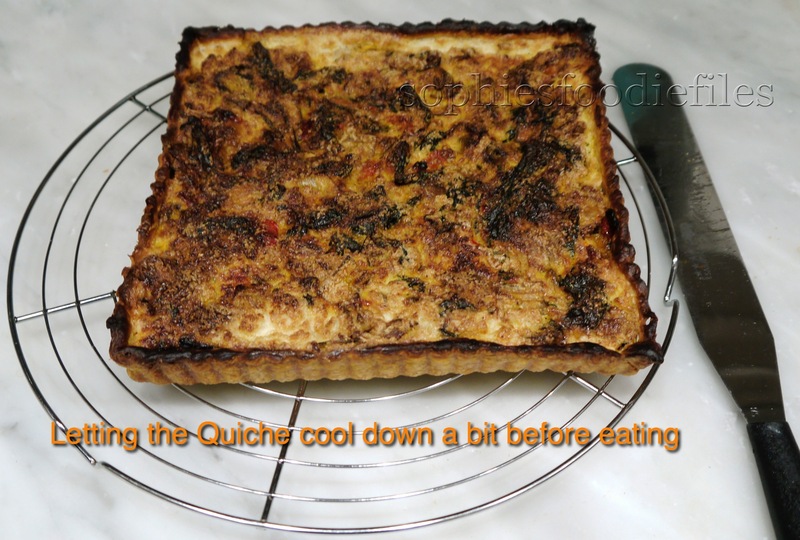 That makes the Quiche lighter then other quiches! I serve it with a mixed side salad & sliced Kumato tomatoes with chopped chives. On top of that, I drizzle some of my lovely dressing over the top! It is a mix of Balsamic vinegar, olive oil, mustard , honey, black pepper & some Maldon sea salt. It is brown in colour but it is so yummy !! Take a jam pot. Put the ingredients for the dressing in the jam pot. This is: 5 tablespoons of olive oil, a neutral one. Add 1 heaped tablespoon of Dijon mustard. Add 2 tablespoons of your best Balsamic vinegar. Add 1 tablespoon of liquid honey. Add a few grinds of black pepper & some Maldon sea salt to taste. Put the lid onto the jam pot. Shake your dressing up & down! Shake it until the ingredients are well combined. Taste again. It should taste divine!! It is now brown in colour. 1. Take your prerolled pastry out of the fridge & out of the package. Roll it all out. Take your pie dish. Line with baking paper. Place the pastry into the pie dish. Use a fork & prick the base on several places. Place baking paper onto the pastry. Fill with uncooked beans, rice or ceramic beans & place into an oven. Bake the pastry blind for about 15 minutes on 140° C. The pastry has to be crunchy. I added a few minutes extra. Take it out of the oven. Take away the baking paper with the beans in it. Let it cool off . I prepared this an hour before putting the filling in it. 2. Take your cleaned leeks & cut up into little pieces. Take a large cooking pot & add some baking margarine. Heat up on medium high. When hot & sizzling, add the cut up leeks & fry until soft & tender. This took about 8 to 10 minutes. In the beginning, I added a bit of hot water & put the lid on so that the leeks were almost steamed. Then, I take the lid off. When they are ready, the water will be evaporated. I added some grinds of black pepper & just a bit of crushed sea salt. I didn’t add too much salt because the bacon is already salted! When done, put aside with the lid on. Turn the heat off. 3. At the same time, heat a large non stick pan on a high heat. Add a bit of baking margarine & heat up. When hot, add the smoked bacon pieces. Fry until crisped up & ready. Turn the heat of. Drain on a plate with 2 layers of kitchen paper. Then, drain again with a layer of kitchen paper. 4. When you are preparing to have dinner, start preparing the filling. Take a large bowl & break the eggs 1 for 1 into the bowl. Then, loosen the eggs with a fork. So, that the white parts & the egg yolks are well combined. Now, add the soy cream. Mix well. Now, add 1/2 of the grated Gruyère cheese. Mix well with the fork or with a spoon. 5. Take another large bowl & place the bacon pieces together with the leeks. Mix well. Now add the other part of the grated Gruyère cheese. Mix well. 6. Take a large baking tray out of the oven. Preheat the oven to 200°C. for about 10 minutes. 7. Now add the 2 bowls together & mix well. This is all the filling joined together. Some times , I add a few grinds of black pepper. It has to taste fabulous!! 8. Now, place the filled quiche onto the baking try. Place into the center of the oven & bake for about 35 to 45 minutes until a skewer inserted into the middle, comes out clean. 9. The first 10 minutes, the oven temperature will be 200°C. After 10 minutes, cut the temperature to 170 °C. After 15 minutes in total, I open the oven door, & I turn the Quiche because the crust can so be evenly browned on all sides. 10. When ready, a bit brown on top, ready & set, take it out of the oven. Let it cool down a bit. Take it out of the pie dish. Place onto a serving plate & cut into 2 pieces. Take your dressing out of the fridge & shake the jampot up & down to let the ingredients mingle together. Take your salad, tomatoes & cucumber slices & place on the plate. Beside it, place a large piece of the Quiche. Drizzle some of the dressing over it & enjoy!! This is lovely enjoyed with a glass of white wine, like the Spanish wine: Rias Baixas, Miudiño, Albariño 2008. I made it with sheep ricotta & I made it with cow ricotta. I prefer the sheep ricotta because it has more flavour! And that is what it’s all about! olive oil: a soft & fruity olive oil, not a strong one! 2. 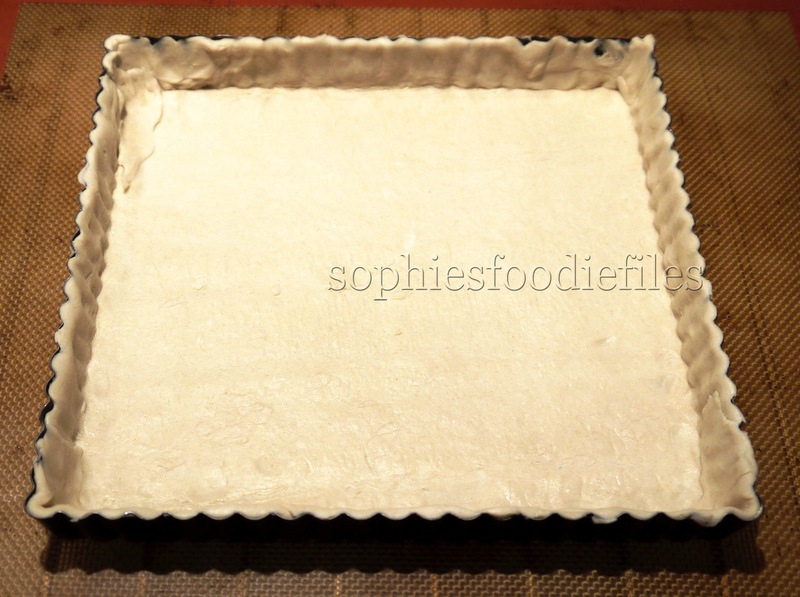 Roll the pastry out on a Silpat or on a baking tray covered with baking paper. 3. Prik the pastry several times with a fork. 4. Take a bowl & add the ricotta, the beaten eggs, the Parmesan cheese, the garlic & basil & season to taste with sea salt & black pepper. Beat until smooth. Taste again. It really has to taste good! Add a bit more grated Parmesan , if needed. 5. Spread the mix over the pastry base, leaving about a 2 cm border. 6. Arrange the tomatoes on top of the ricotta mix. Place them neatly together, pushing them down a bit. season lightly & drizzle with a bit of olive oil. 7. Bake for about 25 minutes until the filling has set & the pastry is golden brown. 8. Take it out of the oven & take the silpat away. Put it on a nice plate & cut up in slices. 8. Serve it with the green salad & cucumber slices & drizzle with the balsamic vinegar dressing. Enjoy! This is lovely with a glass of White Sauvignon Blanc.